The primary reason that Bonnie and I drive a van is that we haul a fair share of freight ourselves. Monday, we carried about 350 books two hours away to meet other team members who traveled nearly as far – for the explicit purpose of transferring the literature from us to them. Janet and Wayne Barrier met Bonnie and me in Tupelo, MS and passed to them books for the next occasion of the World Evangelism School of Missions, soon to begin at the Killen, AL Church of Christ. We enjoyed one another’s company over lunch, and then headed back to our respective corners. That evening, we had a meal at Betty Choate’s home with her mother Theola, and the Bates, prior to the Bates’ departure abroad shortly and our departure in about 30 days. Sunday, Bonnie and I had traveled to the Siwell Road Church of Christ in Jackson, MS – our sponsoring congregation – for morning Bible class and worship. That evening, we worshipped with the West President Church of Christ in Greenwood, MS. Monday, Jerry shipped out boxes of The Voice of Truth International in the mail, and Bonnie and I prepared individual copies of The Voice of Truth International for mailing on Wednesday. All of us worked diligently on preparing the next issue of The Voice of Truth International, plus a thousand other things, too. Each day is filled to the full and we never catch up! It’s good to be fully engulfed in Christian service! Friday, August 26 was freight day, and it was the most notable day lately at the World Evangelism Building in Winona, MS. Four pallets of books and The Voice of Truth International magazine arrived by freightliner, and six pallets of books and The Voice of Truth International were prepared and loaded aboard the tractor-trailer that hot, sweltering afternoon. Tons in and tons out was the order of the day; four of the outgoing pallets weight an estimated 1,000 pounds each and required a little manhandling to get them to the truck and over its threshold and loaded. To help us, brethren from the Huntsville Church of Christ in French Camp, MS and from the West President Church of Christ in Greenwood, MS traveled to Winona to help the five of us (Betty Choate, Jerry and Paula Bates, and Bonnie and Louis Rushmore) who ordinarily form the Winona crew of World Evangelism. One of the inbound titles was my book, The Church Divine, a Bible class study on the identity of the Lord’s church. What we loaded on to the semi-trailer will be hauled to New York for further processing, that is, labeling and inclusion with other international mail. Then, it will be transferred to container ships in New Jersey for shipment to various points throughout the world. In anywhere from two to six months, this precious religious literature will make its way into the hands of final recipients who will treasure it dearly. Everyone who helps financially, provides moral encouragement and prays for this effort is a coworker in this aspect of the Great Commission and world evangelism. Thank you. Otherwise, Bonnie are feverishly trying to get as much done on the next issue of The Voice of Truth International, readying it for the printers, before our departure the end of September for Asia. In addition, we sent off the application for our Myanmar visa – a crucial part of preparation for our trip abroad this fall. Besides this, many daily duties demand attention, and slow down the preparation of the September issue of Gospel Gazette Online; I suspect Gospel Gazette Online will be late in October and November at least as we will be gone for about eight weeks overseas, returning around Thanksgiving. Please remember Bonnie and me from time to time in your prayers. Friday was our first day back in the office since we left for appointments in Alabama, followed by going to Pennsylvania for the funeral of Mary Reed, Bonnie’s mother, and then going to Polishing the Pulpit in Sevierville, Tennessee. It was a full day. Among the activities was shipping some packages and receiving guests twice. Brother and sister Barett from the West President Church of Christ in Greenwood, TN surprised us with a casserole and treated us to lunch at the local Mexican restaurant in Winona. They were a great encouragement to Bonnie and me, especially regarding the passing of Bonnie’s mother. Our second set of visitors was from a bit further away – New Zealand. Brother and sister Rod Kyle stopped by for a few minutes en route to another destination in Alabama. 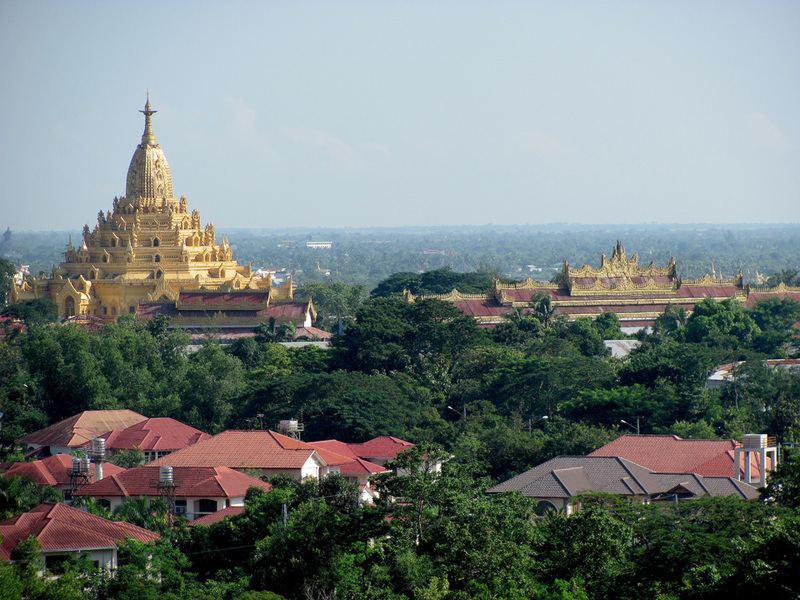 One significant aspect of our day was to prepare our visa applications for Myanmar and get them sent overnight to a courier in the Washington, D.C. area to walk them through the Embassy of the Union of Myanmar. We have a three-month window of opportunity to get the visa, travel to and depart from Myanmar; we are permitted by the visa to stay in Myanmar for a maximum of 28 days. Now we wait for our visas and passports to be returned to us. Our first investment for the trip to Myanmar began with the roundtrip overnight postal expenses, application fees and courier charges. We still have to finish planning the details for the balance of the trip to India and Sri Lanka. Saturday, Bonnie and I caught up on four weeks of grass growth at the house. That took half a day and was daunting with the high heat and humidity. I’m going to have to spread the lawn work over at least two days in the future since it seems to be a more challenging task for me than in years past. Saturday, August 13 was a long, tiring day of traveling from northwestern Pennsylvania to Sevierville, TN. Of course, this was a three-state day: Pennsylvania, West Virginia and Tennessee. We arrived about 10 hours after we departed the home of Bonnie’s brother Jim (and his wife Kay) at the convention center – at about 7:00 p.m. By 9:00 p.m., we had the two tables set up in the exhibit hall – one table promoting The Voice of Truth International and Global Harvest magazines, as well as tract samples and my book Beverage Alcohol. The display behind these offerings touts colorful pictures of mission work from around the world in which the World Evangelism Team is involved. The second table hosted numerous books for sale (see the online book store at http://store.gospelgazette.com/). Next, we went to Pizza Hut for supper and bumped into some of the elders and their wives from the North Lexington, KY Church of Christ. After parting company, Bonnie and I went shopping for breakfast and lunch foods for in the hotel room, and so we arrived back at our lodging by 11:00 p.m. Finally, by a little after midnight, we turned out the light for a much needed night’s rest. Sunday, morning we realized that we forgot to buy milk and bowls for the cereal; so, breakfast was a cereal bar apiece. Then, Bonnie and I traveled about an hour away to Greeneville, TN where I taught the Bible class in the auditorium and preached during the morning worship. My PowerPoint The One True Church of the Bible in the class was followed in worship with the PowerPoint Beverage Alcohol. A year earlier, one of the elders had come across my book by the same name and had ordered a case for the congregation. Now, it was my privilege to expound on the subject live, too. Following worship, we were treated to a fine meal at Ryan’s and enjoyed good company. Sunday evening, we returned to Polishing Pulpit (PPT) for evening lessons. Monday, Bonnie and I taught classes of children; I taught 6- through 9-year-olds and Bonnie taught 10- through 12-year-old girls. Later, we taught a combined class with about 100 little ones in attendance. Tuesday and Wednesday was more of the same. We taught a combined 10 hours in three days to precious youngsters – one child stating that I have been teaching her since she was 6-years-old and she is now 10; she also says that I am famous for my (Bible) maps that I teach annually. Young ones smile and wave as we see them pass in the halls. We also taught this year Buckets of Bible Time besides Bible Maps and miscellaneous information about Bible Geography. Bonnie taught an outreach class for the girls. She also talked to them about our foreign mission work, and the young ladies especially enjoyed trying on Bonnie’s clothes from India and Myanmar (Burma). Thursday morning before heading out, children’s classes provide a little fun and games for them. As a part of that, Bonnie worked the cotton candy machine. She said she ruined the first batch, but she got the hang of it by the second batch. Also Thursday morning, on behalf of World Evangelism/J.C. Choate Publications literature, I handed out to future preachers (10- through 14-year-old boys) who made speeches The Voice of Truth International and Global Harvest magazines, Beverage Alcohol book and a sermon outline book or other book of their choice. PTP is one of the finest programs within the churches of Christ, and it is a time to maintain and develop rapport with fellow Christians, besides being edified by the many good lessons from which to choose. PTP is heavily pointed toward Christian families, so much so that nowhere else in the brotherhood have I seen such a high attendance by families with children. After Thursday morning lectures, it is time to help tear everything down before heading homeward. The frog fountain was just part of the décor, much of it with water themed, of PTP. 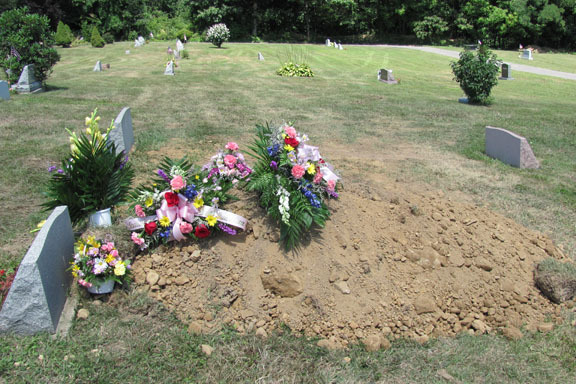 Not long after midnight on August 8, 2011, Bonnie’s mother passed away. Two weeks earlier while Bonnie and I were in Linden, Guyana, South America, Bonnie’s brother Jim tracked us down to inform us that Mary Reed had suddenly taken a turn for the worse and was hospitalized in Meadville, PA; my wife’s 83-year-old mother had been going downhill steadily we could see each time we visited her in the nursing home, but she seemed in fairly stable health in June of this year. However, a team of medical issues besieged her all at once: pneumonia, a mersa staff infection, her kidneys shut down and each time she swallowed food went into her lungs. Mary E. Reed of Cambridge Springs (formerly of Greenville) passed away Monday, August 8, 2011 at 12:30 a.m. in Meadville Medical Center. She was 83 years old. Mrs. Reed was born July 7, 1928 in Adamsville to Hervey Henry and Gladys Hunt Henry. She graduated from Penn High School in 1946, and on September 19, 1947 she married her husband Roy Reed, who preceded her in death in 1982. Mrs. Reed worked most recently at the former Blazon Corp. in Jamestown. Mrs. Reed was a member of the First Church of God in Greenville and past-president of the Fraternal Order of Eagles Women’s Auxiliary in Greenville. She also enjoyed bowling, reading, bingo and crafts. Mrs. Reed is survived by two sons, James (Jim) Reed and his wife Sharlene (Kay) of Cochranton, and Larry Reed and his wife Donna of Atlantic; two daughters, Bonnie Rushmore and her husband Louis of Winona, Mississippi, and Dianna Reed and her fiancé Edward Korab, Jr. of Sharon; a brother J. Melvin Henry of Doylestown; a sister Doris Pearce and her husband C. Robert of Greenville; nine grandchildren; seven great-grandchildren; and several nieces and nephews. She is preceded in death by her parents; her husband; a daughter Colleen Reed; a granddaughter Lisa Reed; and two sisters Madlyne and Dora Henry. From birth onward, every person marches relentlessly toward his or her departure from the land of the living. It’s just a matter of time for each of us, and we all will cross the same threshold from life to death. Besides personal observation, and particularly today as we are painfully aware of the comparative brevity of life, Hebrews 9:27 summarizes the path on which each of us finds himself or herself. I. There is an appointment that none of us can miss though we may want to miss that appointment or at least to delay it as long as possible (Hebrews 9:27). A. There are many appointments in life for which we may be late or dismiss altogether. Dentist, doctor, auto repair and similar appointments populate our personal calendars. Not long ago, I cancelled a doctor’s appointment, and I have been late for other appointments. We can even reschedule some appointments in this life. B. However, not one of us can reschedule the appointment called death, followed by Judgment. “Man who is born of woman is of few days and full of trouble. He comes forth like a flower and fades away; He flees like a shadow and does not continue” (Job 14:1-2 NKJV). “…you do not know what will happen tomorrow. For what is your life? It is even a vapor that appears for a little time and then vanishes away” (James 4:14). “All flesh is as grass, and all the glory of man as the flower of the grass. The grass withers, and its flower falls away” (1 Peter 1:24). C. Whether one lives a long time or passes away prematurely, all of us are aware of the relative brevity of life. “The days of our lives are seventy years; And if by reason of strength they are eighty years, Yet their boast is only labor and sorrow; For it is soon cut off, and we fly away” (Psalm 90:10). Mary Reed recently turned 83-years-old. Regardless of how long we live, our lives are short compared to the eternity to come. II. Therefore, the wisest course of action that any of us can take is to make adequate preparation. A. The Old Testament prophet Amos warned people of his day, “…prepare to meet thy God, O Israel” (Amos 4:12). That warning is as appropriate for mankind today as it was anciently for the nation of Israel. Often as I drive around the states, I see Amos’ warning on signs in people’s yards. B. Several New Testament passages, likewise, warn about making appropriate preparation for eternity. We need to be ready for the sudden, unannounced return of our Lord (Matthew 25:1-13; 1 Thessalonians 5:2). “But of that day and hour no one knows, not even the angels of heaven, but My Father only. But as the days of Noah were, so also will the coming of the Son of Man be. For as in the days before the flood, they were eating and drinking, marrying and giving in marriage, until the day that Noah entered the ark, and did not know until the flood came and took them all away, so also will the coming of the Son of Man be. Then two men will be in the field: one will be taken and the other left. Two women will be grinding at the mill: one will be taken and the other left. Watch therefore, for you do not know what hour your Lord is coming. But know this, that if the master of the house had known what hour the thief would come, he would have watched and not allowed his house to be broken into. Therefore you also be ready, for the Son of Man is coming at an hour you do not expect” (Matthew 24:36-44). C. Mary Reed made preparation for her passing from life to death by implementing the words of Jesus in her life regarding forgiveness of sin. Jesus said that a person must believe that He is the Christ or Savior (John 8:24). Jesus said that a person must repent or change from sin (Luke 13:3). Jesus said that a person must be willing to acknowledge before others that Jesus is the Christ or Messiah (Matthew 10:32-33). Jesus said that a person must be baptized to be saved (Mark 16:16). Jesus said that the child of God or Christian who remains faithful until death will be rewarded in heaven with a crown of life (Revelation 2:10). While humans often surmise who will be in heaven and who will not be in heaven, that is not something that God has delegated to humanity. The eternal destination of any soul is the sole responsibility of the Godhead (James 4:11-12). However, we can comfort ourselves that our God is not only righteous (Romans 2:5; 3:22), but He is merciful (Ephesians 2:4; Titus 3:5; James 5:11; 1 Peter 1:3). Furthermore, Jesus Christ personally will come to retrieve those that are His in the great, last day (1 Thessalonians 4:13-18). If we have not done so already, what you and I need to do before it is too late is to prepare personally for the sudden return of the Lord or our own eventual deaths. Preparation for our departure from this life may include prepaid funeral arrangements, but it includes much more, too. Death is always a hard dose of reality, but the death of a mother is especially difficult to bear. I know from personal experience. At my mother’s funeral, I was surprised at my seemingly uncontrollable emotions, and for a year afterward, I could spontaneously and without warning break into tears. Yet, together, we can make it through the day, the days, the weeks, the months and the years that may lie ahead of us. Sunday evening July 31, Bonnie and I worshipped with the Courtland, MS Church of Christ. We were well received as I presented the PowerPoint lesson Motivated by the Cross; I spoke about our summer 2010 mission trip to Myanmar, our fall 2010 mission trip to Myanmar and India as well as our summer 2011 mission trip to Guyana, South America. We had been the recipients of a fifth Sunday contribution to help us make the Guyana trip. Monday, Tuesday and Wednesday we finished writing, printing and packaging our newsletter and mailed it at the local post office. I was also able to publish the August 2011 edition of Gospel Gazette Online. Then, notifications were dispatched through email for the electronic version of the Rushmore Newsletter and Gospel Gazette Online. It is far easier to summarize the doing of these activities than the hours and days required to accomplish the same. Thursday and Friday were the days for the annual World Evangelism meeting in Winona. Several with whom we voluntarily cooperate in world missions spent the time fellowshipping, eating and discussing ways in which we can be more effective in the future for the Lord. Dennis and Sharon Larson were in from North Carolina, and Don and Sylvia Petty with a young lady Allison were in from Texas. L.T. and JoAn Gurganus attended from Alabama, as well as Janet and Wayne Barrier plus Joey and Jeremiah Barrier also from Alabama. Madolyn and Gene Gibson stopped by; the Larry Murdochs visited. Of course, the Winona bunch was present: Jerry and Paula Bates; Betty Choate; Bonnie and me. Saturday, Bonnie and I loaded the car with baggage, books, tracts and displays for our Sunday appointments in Decatur and Huntsville, AL. Bonnie’s mother was deathly sick, and we planned to travel to Pennsylvania to be with her following the Sunday evening appointment. After departing Pennsylvania, we knew that we would be going to Sevierville, TN for the Polishing the Pulpit program before returning to Winona. Saturday evening, we lodged in Decatur, ready for Bible class and morning worship with the Austinville Church of Christ. Sunday morning, I presented Motivated by the Cross about our overseas missions to the auditorium Bible class. For worship, I preached What Is Jesus’ Plan for Me? The Austinville brethren are such great encouragers of Bonnie and me. Brother and sister Tim Hester graciously treated us to lunch before our departure to Huntsville. Sunday evening, Bonnie and I worshipped with the Farley Church of Christ where Paul Clements is the preacher. Once more we were greatly encouraged. Following our leaving the Farley congregation, we began our journey to Pennsylvania to be with Bonnie’s mother one last time. We traveled for a few hours, crossing through Tennessee to Bowling Green, KY where we lodged for the night. However, Mary Reed passed away shortly after midnight, and we slept very little after receiving that mournful phone call. We had visited her in May, but we failed to arrive at her hospital bedside previous expiring. Monday was a somber trip of several hours. The viewing will be Thursday, and the funeral will be Friday morning. I will be officiating at the service. It has been my lot over the years to lead the prayer for family gatherings and to bury the dead. Saturday, we will drive to Sevierville, TN for Polishing the Pulpit. Bonnie and I are scheduled to teach children’s classes for several days in the program. Sunday, we have an appointment about an hour from Sevierville. Amidst traveling and funeral preparations Bonnie worked on the next issue of The Voice of Truth International and I sent emails to various brethren abroad in preparation for the fall mission trips to Myanmar and India a few weeks from now. Oh, I left my phone charging cord in the motel in Bowling Green. Today, I lost my comb, too. Fortunately, my head is attached! Having traveled six states by automobile in three days, there is no telling in which state I would have left it.